Who is MyBirdDNA laboratory ? MyBirdDNA laboratory is a world leader laboratory specialized in birds analyses and more particularely in DNA tests. Our website is available in 107 langages and more than 300 countries. 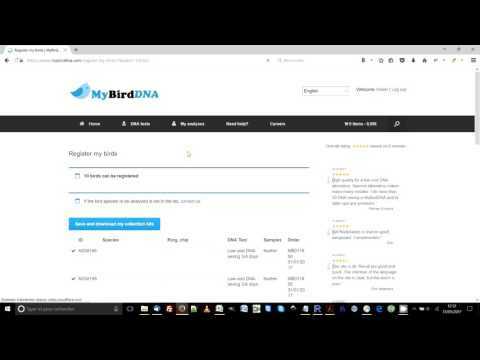 How to do an order to MyBirdDNA? What is the delay of an analysis? For express analysis, 1 day when we receive the sample. For low cost analysis, 3 – 6 days when we receive the sample. The delay does not take into account the time that your samples arrive to our laboratory. These periods are guaranteed provided the sample quality is correct. Can you send me collection kits ? Collection kits are automaticaly send you by email after you do an order and register your birds. If you cannot print, you can copy it in a blank paper. Can I use my own collection kits or those of another lab ? Samples kits are obligately those of our laboratory. You can download them in the “Ny mampifamahofaho” tab. If you can not print it, you can copy them to a blank paper. Do you have receive my collection kits ? You will receive an automatic email as soon as we receive your samples. What is the accuracy of the DNA tests ? What kind of samples should I provide? Only one sample is needed even if several analyses are order. For example, if you need DNA sexing and PBFD, you just have to provide only one sample of feathers. How to collect feathers for DNA test ? - use only collection kits we sent you by email or copy them on plain paper if you can not print it. Other collection kits will not be accepted (plastic bag, envelope). - 3 or 4 feathers must be pulled out from the bird . The feathers fell to the ground or that the bird pull himself will provide no results and analysis will be charged. - feathers must have the Calamus (peak at the end of the feather). - the tape to fix the feathers should not be on the Calamus (peak at the end of the feather). How to perform a cloacal swab ? Can you send me paper certificates ? Results are only send by email. For each analysis you will receive an official certificate with the result. Are the DNA certificates translated in my language? The certificates of MyBirdDNA laboratory are available in 107 languages. Thus, the certificate will be send in your language. You can also download it in another language in the My analyses tab by changing the default language. The name of my species is not in my language. How can I translate it so that the species name in the certificate will be in my language? When you register your bird (following an order or in Register my birds in "my analyses" tab), you must first select the species in the table of your analyses. If the species you have choose is not already translate in your native language, then the image will appear under the species. You have to click on this image and enter the name of the species in the open box. If found some translation errors in the website. How can I report it and help you? The best is to send us an email with the contact us tab. We offer free analyses to people who help us in the translation task. Can I send the samples of a pack in one time or multiple times? How along I have to send samples of the ordered tests? You can order a DNA test pack and carry out the DNA tests in several times within the limit of 2 years. You can for example order the pack of 50 DNA sexing, send 2 DNA tests tomorrow, 3 other DNA tests in two months, 25 samples in 1 year etc. Can I order a pack of analyses and do it on different birds ? For example if your order the pack Low cost DNA sexing + Low cost PBFD, we will do the DNA sexing and the PBFD on the same sample. Can we determine the age of a bird with a DNA test? This DNA test is not available. Nahoana no mandany vola bebe kokoa?